Ladies, do singer-songwriter Jonathan Coulton and give it up free. Hate your day job? Quit. That might sound like bad advice in a recession, but sometimes you&apos;re better off chasing dreams. Take Jonathan Coulton, who quit a computer programming gig in September 2005 to pursue his dream of becoming a professional musician. Using a "Thing A Week" gimmick, delivering a new song on his web site every week for a year, as well as accessible podcasts, he built a rabid, interactive fan base and became an internet star. Complex: Why did you decide to use the Internet to start your music career? Jonathan Coulton: I didn&apos;t want to start by playing in clubs with really small crowds of my friends. I&apos;d done that a bit and it&apos;s no fun. I knew that there was something happening on the web with bands getting big on Myspace but I wasn&apos;t sure of how to make it work exactly. My plan was just to start putting stuff out there and see what happens. Best-case scenario, I sit at home in my underwear, record songs, put them on the Internet and I make a living—and it turns out that it actually does work. Complex: When you started, were you doing anything to publicize yourself? Jonathan Coulton: No, I wasn&apos;t. Again, this was another part of my strategy of laziness. I didn&apos;t know how to promote online. It&apos;s really hard; there&apos;s something about the aesthetic of web content that people really bristle when they feel like they&apos;re being marketed to or pitched. I knew that writing and recording a song a week for a year was a bit of a stunt that might attract attention, like, "Is he going to make it? Are the songs going to be good?" Complex: How, specifically, did you start putting your music out on the web? Jonathan Coulton: I wanted to make [my music] as freely available as possible, so I published all the songs as a podcast, so people could subscribe and get these songs for free. When I released them, I just put a link to the mp3 in my blog post. I&apos;m going to quote a fellow musician and internet superstar Brad Walsh, who said to be as slutty as possible with your music. He means just put it out there and make sure it&apos;s in an unprotected mp3 format. It doesn&apos;t hurt you to give it away. Not everybody feels comfortable with that but you should not hesitate to put your music in all of these locations available to you, like Tunecore, LastFM or Pandora. There&apos;s a vast ecosystem for music outside of Myspace and Facebook and you need to make sure that your music is in as many hands as possible. I wanted people to share my music and tell friends about me, and if you want to rely on word of mouth, you have to make it easy for people. I got lucky because I had a few songs that hit big and got a lot of links on blog posts. Complex: Did you ever feel like you might need a record label? 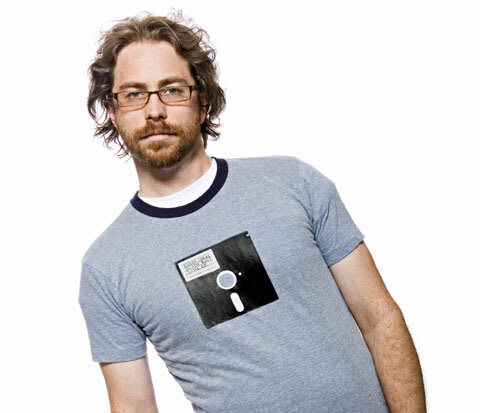 Jonathan Coulton: Before the Internet, you really did need a record label. A label is basically a bunch of people taking care of the business side of things for you, which is great, but if you&apos;re comfortable thinking about business and you like making spreadsheets about T-shirt sales like me, you should do it. In response to the New York Times story about me, some people said, "If Coulton&apos;s gonna spend four hours a day at his laptop he might as well have a day job." It&apos;s kind of true, but I&apos;d be at my laptop anyway. Complex: Most young people are plugged in at all times anyway, "marketing" themselves at an early age. Jonathan Coulton: Yeah, you can become a famous rockstar while you&apos;re in college now. You don&apos;t have to devote your physical presence to this job anymore. You can sit in your room, make music and put it out there. It&apos;s very easy to set yourself up on the internet as a presence, whatever that means, whether you&apos;re a musician, a blogger, or whatever it is. Just start putting stuff out there. Complex: With regards to doing shows, you use the web to locate fans so you never play empty venues, right? Jonathan Coulton: Yeah, and it really keeps me sane. I was playing to a modest crowd somewhere in Massachusetts and there were like only three people there when the band after me started to play. They were on an East Coast tour and I was thinking, "Man, that&apos;s so disheartening that you&apos;ve just driven in a van for four hours, spending all this money to haul all of your gear, feed everybody and put everybody in hotels and you get to this place and nobody shows up." That has to be totally demoralizing. Complex: How many people show up to your shows on average? Jonathan Coulton: It depends on the city. I do well in San Francisco and Seattle. I can do shows for 500 to 800 people there. I&apos;m happy at the size that it is now. I&apos;m making a living. I&apos;m not getting super rich and I can&apos;t fill an arena with 25,000 people but at the same time I can go to the grocery store without having to sign autographs. Complex: You didn&apos;t have a lot of experience playing live when you started. What did you learn as a new performer? Jonathan Coulton: Mistakes are OK—they&apos;re a part of the live experience. I forget chords and lyrics in the middle of songs. I used to get really nervous but I&apos;ve learned not to worry so much; the audience loves when I screw up. They go crazy. It&apos;s always their favorite moment. Another thing I&apos;ve learned is that the audience not only wants to be talked to but they also like to talk back. Maybe that&apos;s not a universal thing but people at my shows always have something to say. I love it because it encourages the spirit of having a good time together and it takes the show to places that I wouldn&apos;t be able to take it without their participation. The show becomes something that we&apos;re all working on together. That sounds really cheesy but I mean it. Complex: The web is interesting because it can create a sense of friendship between artists and fans. Do you enjoy that? Does it ever get uncomfortable? Jonathan Coulton: It&apos;s definitely a double-edged sword. On the one hand, I invite this kind of relationship with fans because they&apos;ve helped me and it&apos;s also fun for me, but yeah, there are some times when certain people do cross the line. But I&apos;m just a dude and I feel like being completely isolated would be kind of a drag. I really do get a lot of energy from feedback from fans. People create music videos and artwork for my music. Complex: What&apos;s the craziest thing fans have done for you? Jonathan Coulton: A bunch of fans got together and mailed a stuffed monkey to each other. They kept a journal and the monkey collected souvenirs as it went around the world, then they sent everything to me in a box as a birthday present. It&apos;s weird but it&apos;s amazing, and it&apos;s great to know people are thinking about you. It&apos;s a huge ego boost and anyone that says they don&apos;t love that is lying.